Turkish President Tayyip Erdogan on Tuesday dismissed attempts by Riyadh to blame Jamal Khashoggi’s “savage” killing on rogue operatives. 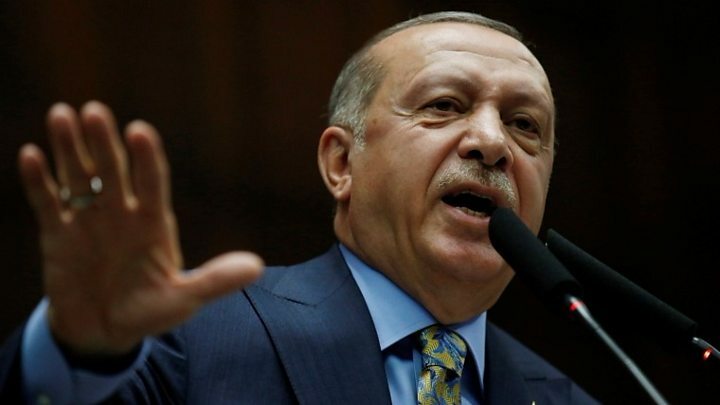 Erdogan also said that the person who ordered the death of the prominent Saudi journalist must “be brought to account”. Erdogan, in a speech to parliament about a case that has sparked outrage around the globe, did not mention Crown Prince Mohammed bin Salman, who some U.S. lawmakers suspect ordered the killing. However, he said Turkey would not complete its investigation into Khashoggi’s death until all questions were answered and Turkey was told the identity of a local collaborator Riyadh says disposed of the body. “Intelligence and security institutions have evidence showing the murder was planned. “Pinning such a case on some security and intelligence members will not satisfy us or the international community. “The Saudi administration has taken an important step by admitting to the murder. “From now on, we expect them to uncover all those responsible for this matter from top to bottom and make them face the necessary punishments. “From the person who gave the order, to the person who carried it out, they must all be brought to account,” he said. A Saudi cabinet meeting chaired by King Salman said Riyadh would hold to account those responsible for the killing and those who failed in their duties, whoever they were. Erdogan said the whereabouts of Khashoggi’s body were still unknown and he demanded Saudi Arabia reveal the identity of a “local cooperator” who purportedly took the body. Erdogan’s speech coincided with the opening in Riyadh of an investment conference which Western political figures, leading international bankers and company executives boycotted because of the furor around Khashoggi’s death. Khashoggi, the Washington Post columnist, a sharp critic of the crown prince, the kingdom’s de facto ruler, disappeared few weeks ago after entering the Saudi consulate in Istanbul to obtain documents for his upcoming marriage. Turkish officials suspected Khashoggi was killed and dismembered inside the consulate by Saudi agents. Turkish sources say authorities have an audio recording purportedly documenting the killing of the 59-year-old. However, Erdogan made no reference to any audio recording in his speech. Riyadh initially denied knowledge of his fate before saying he was killed in a fight in the consulate. That version of events was greeted skeptically by several Western governments, straining relations with the world’s biggest oil exporter. Erdogan said three operatives arrived in Istanbul the day before Khashoggi’s killing on an apparent reconnaissance mission. The next day 15 people came to the consulate, including security, intelligence and forensic experts, while consulate personnel were given the day off. He added that he wanted Saudi Arabia to send the suspects to Turkey for trial. However, the White House and the U.S. Department of State did not immediately respond to a request for comment on Erdogan’s remarks. U.S. President Donald Trump has repeatedly played down any suggestion that the crown prince was involved in the killing however also warned of possible economic sanctions. Trump has also repeatedly highlighted the kingdom’s importance as a U.S. ally and said Prince Mohammed was a strong and passionate leader. For Saudi Arabia’s allies, the question will be whether they believe that Prince Mohammed, who has painted himself as a reformer, has any culpability. The media report said King Salman, 82, had handed the day-to-day running of Saudi Arabia to the 33-year-old prince. Flood: No date yet for resumption of schools in Bayelsa - Govt.